I’ve made Paneer before, when I lived in Islington where I could get hold of cheese cloth. But now, you would have thought the whole of North Lonon had run out of muslin. How annoying. Ever since I found out how easy it is to make Paneer it seems to be a waste to buy it. As Londis did have paneer, even if it failed miserably in the muslin stakes, shop bought would have to do. The idea of cheese in any sort of Asian dish does seem a little odd at first, but then paneer isn’t your usual cheese. Pretty bland to the taste (at least the shop bought stuff is), it does pick up the flavour of pretty much whatever you cook it with. In this aspect it is much like tofu and really does add something in terms of texture. It’s really good if you’re in the need of something non-meaty and simple. Okra, on the other hand bring something completely different to the table. It;s definitely green in taste – plant-like, and vaguely slimy, but in a really good way. It;s hard to explain, but this sticky, sappy pointy vegetable is very moorish In this way it’s a bit like aubergine in that it brings both taste and an unusually texture to any dish. It tastes nothing like aubergine though. Obviously. Both dishes benefit from some sort of added oomph, particularly the paneer. In this case I had a whole pack of birds eye chillis and a tin of chopped tomatoes – in went a couple of those chillies and the tommies, along with nutty cumin and pungent garlic. In all honesty, the both would have benefitted from some lemon juice or similar, just to add a little more balance. Alternatively some warming spices like cinnamon would have been good. But simple is what I was aiming for and that is what I got – soothing and easy to eat. Just the ticket for a gentle and lazy Saturday night. Chop one of the chillies. Thoroughly wash the spinach and put the wet leaves in a saucepan with the chilli and heat in a covered pan until cooked. Squeeze out the water and chop into mush. Heat the oil over a medium heat and add the fenugreek seeds and stir for 30 seconds or so. Finely slice the onion and chuck them into the pan stirring until lightly browned. Finely slice the garlic and remaining chilli, add to the pan along with the cumin seeds and stir for about another minute then add the tomatoes and fry for five minutes until the liquid is almost gone. Add the cubes of paneer and stir until it is starting to colour. Add the spinach and stir until it is heated through. Slice the tops off the Okra fingers and slice into slices about as thick as your index finger. Watch out for the sap – it gets pretty sticky when you’re chopping away. Finely slice chilli (discarding the seds of you don’t want it too spicy), celery and the onion. Fry the onion and celery in oil over a medium heat until lightly brown. Add the chilli and cumin seeds and fry for about another minute or two. Add the okra pieces and stir and fry over a low medium heat for about 5 minutes. Add the tomatoes and stir them in. Cook for another 5-6 minutes, until the okra is done, stirring occasionally to prevent the okra from sticking. I love paneer so much, though I usually go for the cheesy peas option ie mutter paneer, because takeaway/restaurant sag is often too slimey. Your version looks lovely though – will have to try for myself. 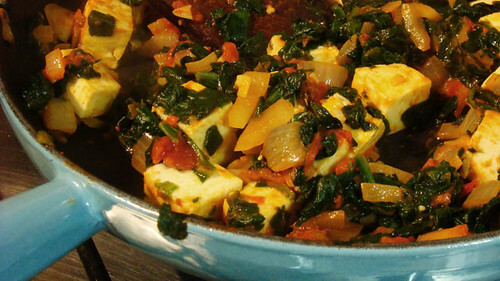 Is paneer really easy to make? As soon as you get some muslin, you have to write about it. It was a real revelation to me – there’s a great post on Thursday’s child (blog) about it. Basically you add lemon juice to whole milk and heat until it curdles. Pour it through muslin and press all the liquid out. Put the muslin wrapped package on a flat surface (sink/draining board is good) stick a heavy weight on top and leave for 24-36 hours. Voila, you have solid curd cheese. And it tastes so much better than the shop stiff, not quite as firm or rubbery either which is kind of nice. I cooked paneer today, too. Next time, I might just make my own, like you did. Love the colour of your pan, btw! That okra looks delicious too – one of my favourite vegetables! These curries look great, you are right about paneer being easy to make, I did it once but haven’t manage to again down to forgetfulness rather than laziness. I am bit funny about Okra though, I find the texture a bit weird but if its in small pieces in a good curry I can overlook it!! two v lovely vegetarian dishes you’ve prepared. am a fan of ladyfingers- if you buy the frozen brand, they wont ooze so much. I do like some veggie dishes – i try (and pretty obviously fail) to only eat meat two-three times a week. It means i can afford better cuts and tend to enjoy the flavour more rather than take it for granted. Love home-made paneer, mum makes it from time to time. There’s a recipe and pictures on Mamta’s Kitchen too plus lots of dishes to make from it. Any friend of the alphonso mango is a friend of mine! @Kavey – i’ll have to check out the paneer recipe. I love how easy it is to create. And aren;t Alphonso mangoes the absolute best thing ever!